Iron Maiden guitarist Dave Murray has teamed with Fender to launch his own signature guitar line as part of the company’s Artist Series. 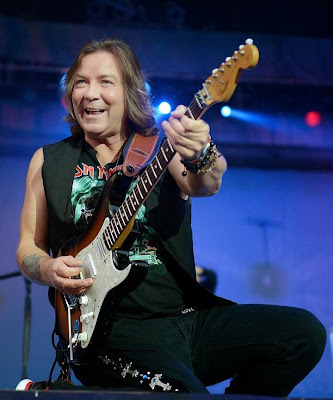 The Dave Murray California Series Stratocaster is inspired by Murray's longtime onstage go-to guitar, combining Strat tradition with three Seymour Duncan humbucking pickups, the fast feel of a compound-radius fingerboard, and the high performance reliability of a Floyd Rose bridge and nut. The new guitar line will be available starting February 17. For more details, visit Fender guitars. Murray and Iron Maiden have been off the road since they wrapped up their Maiden England world tour last summer. The trek saw the band play 100 shows to more than 2 million fans in 32 countries over the course of the 2-year run, which began in June 2012 in Charlotte, North Carolina.